But the new documentary, which will air on HBO and Channel 4 in the UK, shows the Grammy award winning artist to be 'a fiend, a smooth predator and a monster', according to one critic who has seen it. 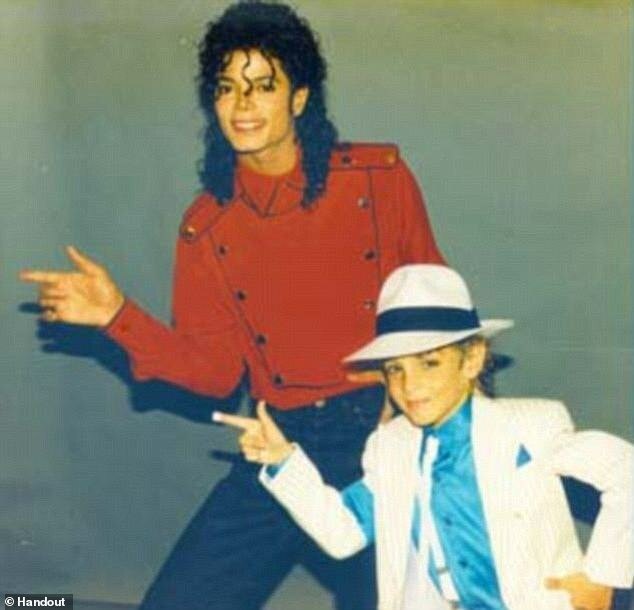 Both men go into graphic and specific detail about what allegedly happened in Jackson's bedroom when they were just children, with both men claiming they were abused from approximately the age of 7 until they were 14. 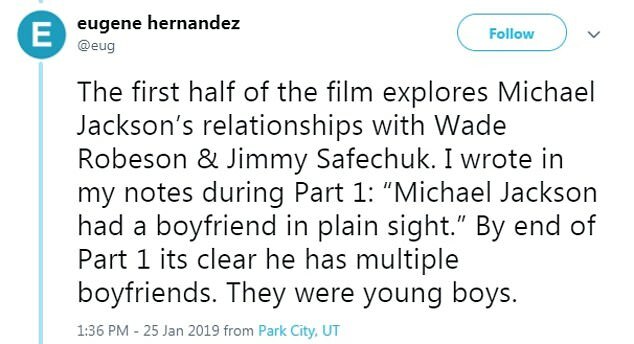 It also accused Wade Robson and James Safechuck, who gave detailed accounts of the abuse they have long claimed to have suffered at the hands of MJ, of being 'two perjurers'. This description was a reference to sworn statements they gave while Jackson was alive stating he had not molested them. Robson, a choreographer who has worked with Britney Spears and other top acts, testified for Jackson's defense at the 2005 trial that ended with the pop star's acquittal on molestation charges. 'The film takes uncorroborated allegations that supposedly happened 20 years ago and treats them as fact,' the Estate's statement said. 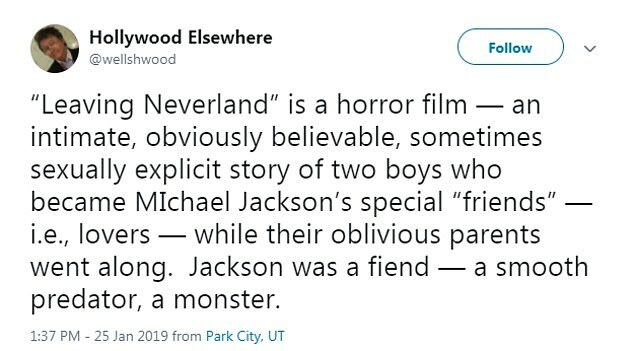 It also accused the filmmakers of relying too heavily on the stories of the two men and ignoring the accounts of others who have said Jackson never harmed children. 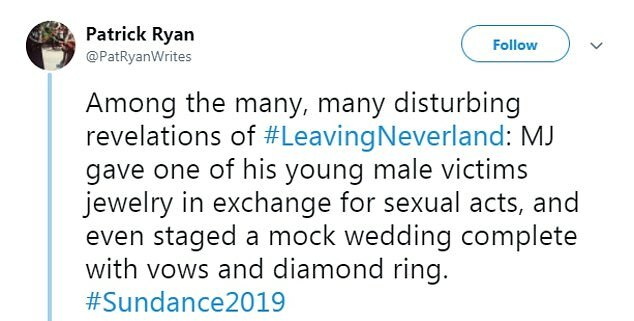 ''Leaving Neverland' isn't a documentary, it is the kind of tabloid character assassination Michael Jackson endured in life, and now in death. 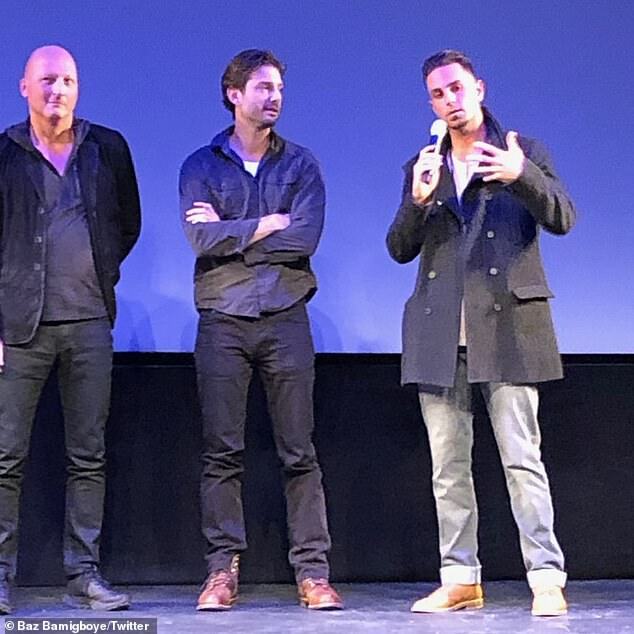 'The film takes uncorroborated allegations that supposedly happened 20 years ago and treats them as fact. These claims were the basis of lawsuits filed by these two admitted liars which were ultimately dismissed by a judge. 'The two accusers testified under oath that these events never occurred. They have provided no independent evidence and absolutely no proof in support of their accusations, which means the entire film hinges solely on the word of two perjurers. 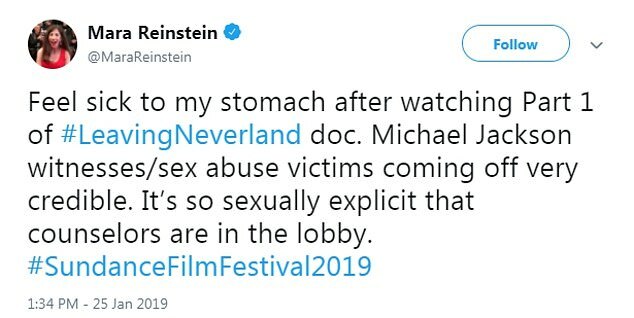 'Tellingly, the director admitted at the Sundance Film Festival that he limited his interviews only to these accusers and their families. 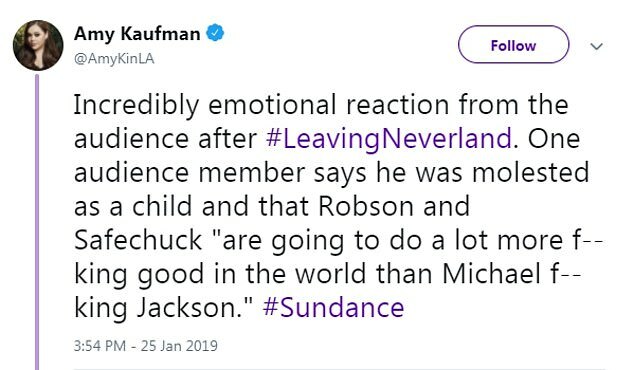 In doing so, he intentionally avoided interviewing numerous people over the years who spent significant time with Michael Jackson and have unambiguously stated that he treated children with respect and did nothing hurtful to them. 'By choosing not to include any of these independent voices who might challenge the narrative that he was determined to sell, the director neglected fact checking so he could craft a narrative so blatantly one-sided that viewers never get anything close to a balanced portrait. 'For 20 years, Wade Robson denied in court and in numerous interviews, including after Michael passed, that he was a victim and stated he was grateful for everything Michael had done for him. 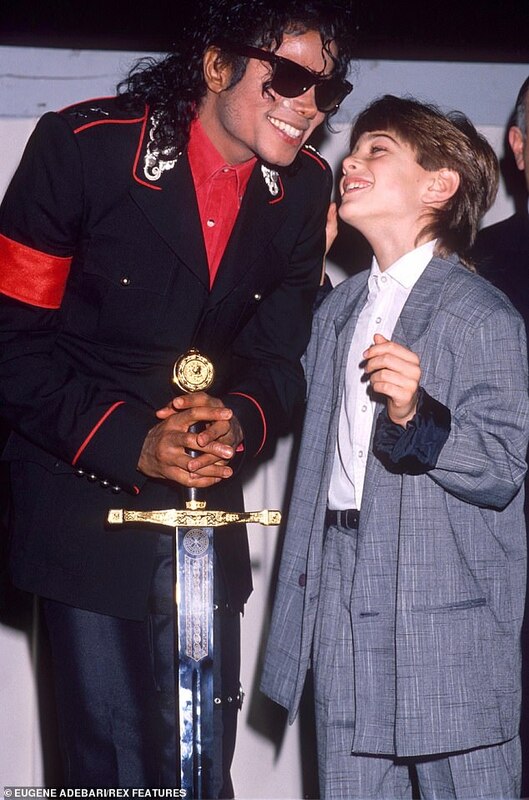 'His family benefitted from Michael's kindness, generosity and career support up until Michael's death. 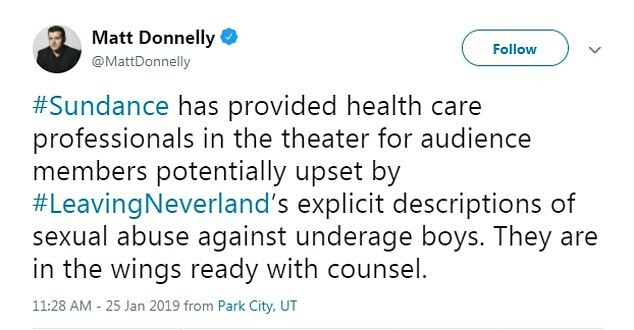 Conveniently left out of Leaving Neverland was the fact that when Robson was denied a role in a Michael Jackson themed Cirque du Soleil production, his assault allegations suddenly emerged. 'We are extremely sympathetic to any legitimate victim of child abuse. This film, however, does those victims a disservice. 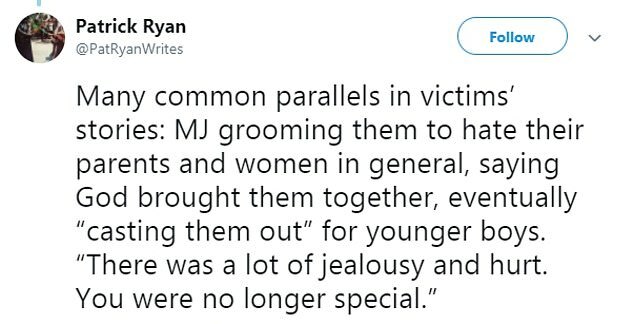 'Because despite all the disingenuous denials made that this is not about money, it has always been about money – millions of dollars — dating back to 2013 when both Wade Robson and James Safechuck, who share the same law firm, launched their unsuccessful claims against Michael's Estate. 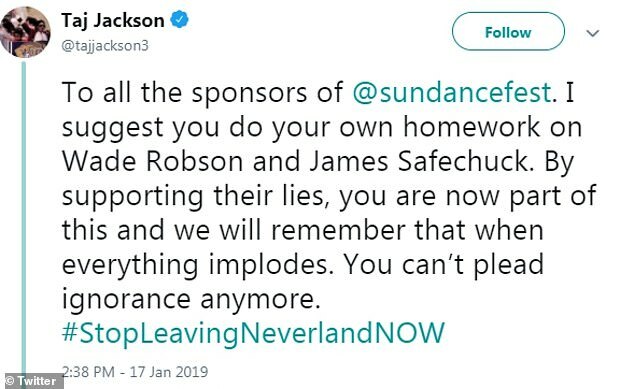 Jackson's family is not staying quiet and last week the normally press shy Jacksons lashed out at HBO for picking up the documentary and Sundance for screening the feature.